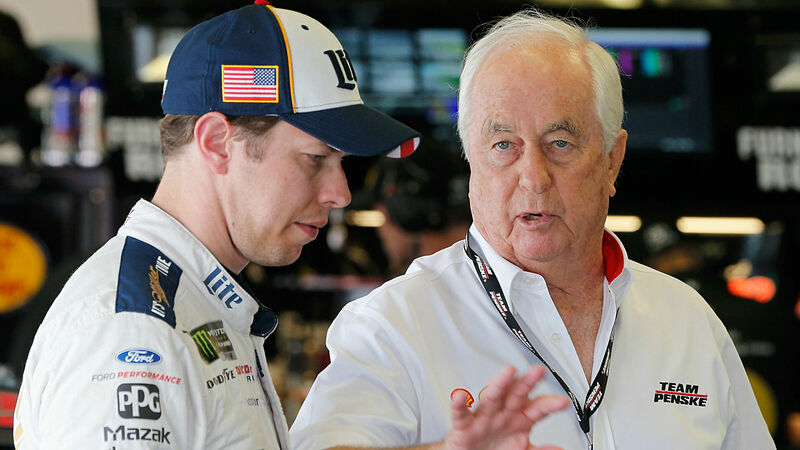 The 81-year old owner and Team Penske namesake is perhaps the most legendary and renowned team principal in all of motorsports with two NASCAR premier series championships — including just last season with Joey Logano — and Daytona 500, Indy 500 victories and IndyCar titles, too. His team has 114 Monster Energy NASCAR Cup Series race victories — including the Daytona 500 and Brickyard 400 — spread out among nine drivers; four of them Cup champions at some point in their careers, and two of them Hall of Famers themselves poised to welcome him among NASCAR’s most celebrated elite. “He’s always growing, always learning, and no matter how successful he is, or how successful he is in his life, he’s always willing to take the time to learn technology, to learn about things in general,” said Team Penske Cup driver Brad Keselowski, who earned Penske’s first NASCAR premier series championship in 2012. The legendary Mark Donohue scored Penske’s first NASCAR premier series team victory — a win in the 1973 season-opener on the Riverside, Calif., road course. At the time Penske dabbled in stock cars while running full force in IndyCar. NASCAR Hall of Famer Bobby Allison won four races for Penske in the mid-1970s and competed full time — 30 races — in a singular season (1976). But Penske didn’t fully establish a lasting full-time presence in NASCAR until 1991 when he hired 1989 Cup champion Rusty Wallace to drive his No. 2 Pontiac. It didn’t take long for the pairing to sync up. Wallace won the sixth race of the 1991 season — from the pole position – at Bristol, then won again at Pocono that summer. It was the beginning of a strong relationship and mighty competitive offering that claimed 37 trophies (most among Penske’s Cup drivers) before Wallace retired following the 2005 season. The two hoisted winner’s trophies in 12 of Wallace’s 15 seasons with the operation. “One thing I’m so fond of, is his ability to understand and tackle things,” said Wallace, a NASCAR Hall of Famer (Class of 2013) himself. That’s become increasingly evident in NASCAR, where Penske is racking up statistics, accolades and big race trophies similar to what he does in open-wheel racing. Penske has three IndyCar championships and an unprecedented 17 wins in the Indianapolis 500 — the latest coming last May with driver Will Power. In NASCAR, Penske has reached Cup Series Victory Lane with nine drivers — starting with Donohue, Allison, Wallace, add Jeremy Mayfield in 2000, the 2008 Daytona 500 winner Ryan Newman, former Cup champion Kurt Busch and Penske’s own Cup championship twosome of Keselowski and Logano. The team’s newcomer — 25-year old Ryan Blaney — won for Penske in his first year with the operation, claiming the 2018 Charlotte road course race. “For me, 33 championships (across all racing genres) that gives us as Team Penske, and certainly to get the Indianapolis race, the Southern 500, and now to think that we’re the champion of 2018 for the Monster Energy NASCAR Cup Series is something that I never imagined at the beginning,” Penske said last November after Logano won the series championship at Homestead, Fla. He added, “There’s really three things that are really — I think — every time I think about how we succeed and how we can be better, one is what’s your brand. “And this kind of winning, not only on the racetrack but in business, drives a great Penske brand, which has been terrific. I think technology is so important when you think about what technology has done to us in business and think about the technology up and down pit lane. You’ve got to be on top of it. That success — from race trophies to the first-class buttoned-up operation that Penske brings to each race series — has absolutely resulted in the kind of victory and acclaim that has earned “The Captain” — as he is nicknamed — the well-deserved honor of NASCAR Hall of Famer. “I think for Roger, who’s done everything there is to do in IndyCar and other forms of motorsports, to get into the world of NASCAR and be able to go in to the Hall of Fame with the driver who helped bring him into NASCAR, back in the early ’90s – to have him win a Cup championship, go into the Hall of Fame. … I think it’s pretty special for him,’’ Wallace said. “When I talk to him, he’s pretty darn excited about it.